The most anticipated time after the wedding itself is the honeymoon. Honeymoons are special because they are the very first holiday with your partner together as a married couple. Naturally then, the most desirable getaways are ones that are super romantic, and at par with a classic rom-com like The Notebook. Although the location of the honeymoon may sometimes not matter, since couples may prefer staying in for some quiet, alone time, it surely does help if your romantic holiday has a fairytale setting. Koh Samui in Phuket fulfils that, and more. It is a lovers' as well as beach-lovers' paradise, with plenty of lovely spots which you can enjoy hand-in-hand with your partner. What's a honeymoon without a picturesque cruise? The Samui Sunset Sailing Tour is a delightful evening cruise with your better half, and a chance to express your love to them like never before with the sun setting in the distance and the sea gushing beneath you. The schedule includes a convenient pick-up and drop service from and to your hotel. The massive cruise liner takes you on a journey along the coastlines of Koh Samui, complemented with a romantic Thai buffet dinner aboard the deck which you can enjoy alongside an infinite view of the horizon. Water sports are one of the best ways to enjoy the beaches of Koh Samui. The Ang Thong National Marine Park offers plenty of opportunities for fun water activities like kayaking, scuba diving and snorkelling. It is located close to Koh Samui and is usually undertaken as a day-trip by boat. With many rich hotspots where flora and fauna species thrive, Ang Thong is full of spectacular attractions and sceneries you can visit. The Koh Wao island with its clear waters is a famous spot for snorkelling. A kayak tour around the various islands here will show you some of the most priceless natural sights. Kamalaya Wellness Sanctuary and Holistic Spa is a luxurious, wellness retreat which is fully-serviced with amenities aimed at restoring relaxation and balance back in your body. They have a superb spa, one of the best in Koh Samui, where you can kick back and relax to have all your stress massaged away. Their special features are Thai healing massages, kati basti back rubs, hand and foot reflexology, which mix medicinal science with traditional knowledge. You can also indulge in other health programs focusing on detox, spiritual peace, Ayurveda and yoga with your partner. Ladyboy Cabarets are a prominent feature of Koh Samui, with most of the shows being situated along the Chaweng Beach. The most notable ones are Paris Follies Cabaret and Starz Cabaret, where beautiful ladyboys deck up in colourful, extravagant costumes and put on fabulous dance musicals which will take your breath away. Some shows even perform for free, making it a hard-to-miss opportunity. Cabaret shows are great for enjoying an evening of entertainment with your spouse, some drinks and a jolly ambience, while also indulging in the culture of Thailand and its people. Thailand is known for its night markets, and a few awesome ones are situated right here in Koh Samui. Roads are lined with shops upon shops, which begin opening when the sun starts going down and function till late into the night. Night markets are nothing short of huge open-air festivals, where every corner buzzes with activity. You can find clothes, shoes, bags, jewellery, souvenirs and much more here, all at dirt cheap prices. The best markets in Koh Samui are the Elephant Walk, Chaweng Night Market, Fisherman's Village and Lamai Night Plaza. They make for leisurely hangout spots with their colourful decor, blazing lights, and good vibes. The Na Muang Waterfalls are magnificent waterfalls located in Koh Samui, and are a popular tourist attraction. They consist of two waterfalls, which aren't located far from each other. Cascading through bushy jungles and large rocks, the larger waterfall culminates into a pool, forming a majestic visual. It looks like a secret tropical cove that is super romantic, and you can cool off with your partner and sunbathe by the rocks here. Aside from being a great picnic spot, the place is also suitable for short hikes and nature trails, and you need only take your spouse by the hand and set off on your own little exploration for some alone time. There is no entry fee to this love haven, so be sure to visit it. A dinner at the Chaweng Regent Beach Resort will perhaps be the most extraordinary dining experience you will ever come across in your life. Under an offer called Dinner in the Sea, they set up an unreal seating for couples right on the sea! This experience is the stuff of dreams, with a floating deck, billowing curtains, waves gushing all around you and not another soul in sight. It is a special candlelit seven-course meal, complete with gourmet food and wine. This is the place to be if you want to take your romance a notch higher. Situated within the posh Six Sense Samui Resort, Dinner On The Rocks is an exquisite rooftop restaurant perfect for couples looking for some quiet romantic time. The rooftop and dining room offer an expansive view of the sky and seas for miles on end, creating an intimate atmosphere at dusk. The food is mostly organic, which is great for healthy eating. There are plenty of seafood like prawn and sea bass ceviche, smoked duck breast, Hokkaido scallops and Turbo to choose from. This is a must-visit if you are looking for a leisurely evening, with good food and wine. Ever dreamed of having your own treehouse? Your dreams will come true at Tree Tops Restaurant, which offers fine dining in an intimate treehouse atop a tree. Located in Antara Lawana Resort, it is a very popular choice among tourists and reservations often have to be made in advance. To maintain its exclusivity, the restaurant only has 8 treehouses, which are surrounded by magnificent trees and lush greenery. The menu has an impressive collection of wines, and meats with Thai flavours. 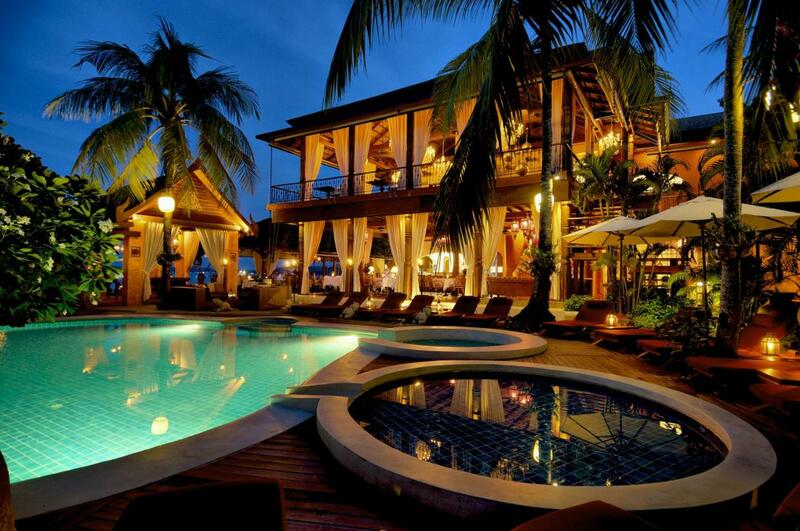 With romantic lights and the sound of the waves in the distance, the restaurant looks magical at night. Zazen Boutique Resort is popular among foreign tourists as a honeymoon favourite, due to its romantic aesthetics. Its top objective is to provide peace and calm to its guests, which makes for an intimate setting for couples. They have many choices of rooms, the most special being the beachfront deluxe and garden deluxe which offer gorgeous views of natural scenic beauty just outside the room. They organise one of the most romantic candlelit dinners, with the best wines, in Koh Samui that you must experience at least once. The Le Spa Zen, a garden spa, is described as one of the most luxurious experiences by frequent visitors, complete with traditional massages and body care treatments that you can enjoy with your partner for an intimate time. 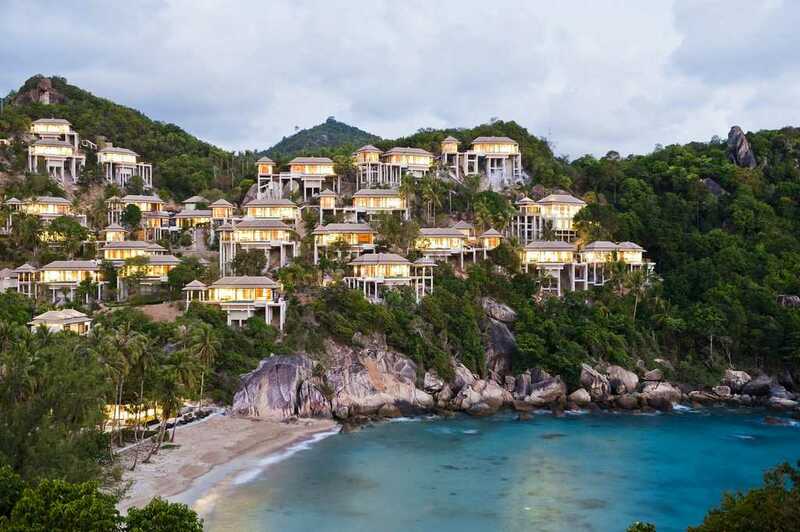 The Banyan Tree Samui, tucked away among hillside jungles, is a romantic resort popular among honeymoon couples. It is situated right along the beach, and staying here is an experience of a lifetime. There are 78 villas categorised according to location and size, that you can choose according to your budget. The resort offers has a holistic approach towards customer comfort, with a relaxing spa for traditional Thai massages and a yoga centre where you can enjoy a mix of health and luxury. The restaurant has fine dining options, where you can have a private dinner with your beloved. Luxury doesn't always come at an expensive price, and the Chaweng Noi Pool Villa is evidence of that. It is a grand experience staying here, with 5-star settings, a lush tropical environment, and 49 villas with private pools to choose from, all at affordable prices. Rooms offer stunning views of the beachfront and hilly forests, and are well-equipped with deluxe services. The famous Chaweng Beach is only a 10-minute walk away from the property, which makes it an attractive choice. The restaurant whips up smashing dishes, ranging from local to international cuisines. Even if you are on a tight budget, you can sip a mimosa by the luxurious poolside here. Romantic cruises, candlelit dinners, couple spas, a little sightseeing and a whole load of relaxation is what a honeymoon is made of in Koh Samui. A holiday here will give you a lot of opportunities for getting to know your partner better, and strengthening your bond with them. Fix on this place for your couple getaway, because a honeymoon in Koh Samui will guarantee you a lifetime of snapshots for your photo album, and your memories.